A page-turning debut in the tradition of Michael Crichton, World War Z, and The Martian, Sleeping Giants is a thriller fueled by an earthshaking mystery—and a fight to control a gargantuan power. 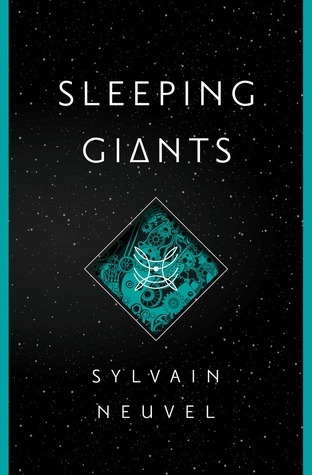 I decided to read Sleeping Giants on a whim when a friend mentioned that it sounded interesting. I'd never heard of this book, being outside of my normal circle of YA, and I wasn't a fan of World War Z or The Martian. However... I am a huge fan of conspiracy theories as well as Ancient Aliens (which I had a hunch this might be related to), so I decided to grab the audiobook when I had the chance! Sleeping Giants is told in the form of interviews and journal entries, which makes for a really unique reading experience. Listening to the audiobook was a fantastic idea because I got to hear this as if I was sitting in on the actual interviews as they happened. Many, many characters make appearances in this book. Some become important and some fade into the background quickly, but each one has something relevant to add. It's honestly such a weirdly written book that it's hard to connect with any one character, but at the same time I felt incredibly invested in each of their stories and outcomes. The one person who ties them all together is the man conducting the interviews, who we never do learn much about. He reminded me a lot of the Smoking Man from The X-Files, only even more mysterious. There isn't much in the way of filler in this book because of the format and I really loved that! I wouldn't say the pace is necessarily fast, but there isn't much time wasted either. I loved following along as each new piece of the robot was uncovered and assembled and found myself on the edge of my seat, waiting to see what would happen when it was complete! My favorite part about this book is obviously the conspiracy! I love, love reading about conspiracy theories no matter how good or bad they actually are and Sleeping Giants has a good one! I'm honestly not sure why this was marketed as World War Z meets The Martian, to be honest. If I was the publisher I'd probably have thrown X-Files in there somewhere, although maybe that's just not what's "in" right now. Regardless, that's the vibe I got from this one. Although the pace isn't breakneck, I always wanted to know a little bit more. I wanted to know what the robot was, where it came from, what it was intended for, and I had a hard time turning the audiobook off when I needed to. This story is fascinating! Sleeping Giants is also loaded with twists, turns, and revelations! Sleeping Giants was wrapped up well enough without a huge cliffhanger, then there was the epilogue which completely blew my mind and now I'm trying (and failing) to wait patiently for Waking Gods, which comes out in like a million years April 2017. Like I said, the pace was very steady and I'm not sure I would've made it through this book if I'd read the physical copy, but the cast who performed the audiobook made it come to life! Sylvain Neuvel has done an incredible job of putting together a story that's entirely unique and may produce mildly obsessive behavior. I would definitely recommend this book to fans of sci-fi or conspiracy theories!